Thirty states are holding elections today for their chief legal officers, and 13 of those races are wide open, with no incumbent running. Democratic attorneys general in California and New Mexico — two of the most active participants in battles against President Trump's handling of energy development on public lands — are up for re-election but appear safe in their positions. But a handful of toss-up elections and open seats in key states could alter the legal landscape on issues like federal, state and local climate regulation; pipeline oversight; and energy development. "One of the most consistent areas where attorneys general have had a major presence has been on energy and the environment," said Paul Nolette, an associate professor at Marquette University and author of "Federalism on Trial: State Attorneys General and National Policymaking in Contemporary America." "As attorneys general have become even more prominent in bringing multistate litigation, they've become even more important — not just on energy and the environment, but this continues to be one of the more important issues." Republicans currently hold the majority of attorney general positions across the country. That matters because although it only takes a single state attorney to start a legal battle against the federal government, multistate challenges are on the rise, Nolette has found in his research. "A bigger number of state challengers gets more attention and can serve as a signal about how nationally important an issue is," he said. 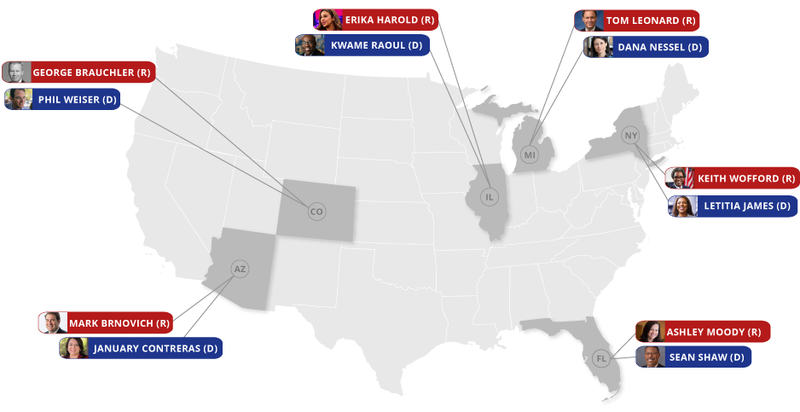 Backers of Democratic candidates for state attorney general are hoping to flip many of the 18 GOP-held seats that are up for grabs in today's election. If Democrats win those contests, they could pursue major legal battles against the Trump administration (E&E Daily, Nov. 5). "Right now, state attorneys general are the only elected officials with the power to push back on the Trump administration's dangerous policies that put our clean air, clean water — our future at risk," Lizzie Ulmer, spokeswoman for the Democratic Attorneys General Association, wrote in an email. "Voters need to understand what is at stake and where candidates stand on energy issues." GOP state attorneys have played a crucial role in supporting the administration's priorities, the Republican Attorneys General Association says. "Energy issues impact all Americans and our economy. A state attorney general has an obligation to defend the rule of law and ensure unelected bureaucrats in Washington do not pre-empt state laws and trample on the Constitution," said Zack Roday, spokesman for the association. "Our founding fathers believed in enumerated powers and allowing each state to determine the best course for their residents. We should all demand this fair and consistent approach from our federal government. "We have not seen such a bright line difference — in approach to the office — as we do now between Republican attorneys general and Democratic attorneys general." Here are some of the most important energy issues to watch in today's state attorney general races. Although Democrat Letitia "Tish" James is expected to win her bid to replace acting Attorney General Barbara Underwood (D), the New York race is important to watch because of the state's critical role in courtroom battles over national energy and environmental policies. Underwood and her predecessor, Eric Schneiderman (D), took 81 actions against the Trump administration's climate, energy and environmental leadership, according to tracking by the State Energy & Environmental Impact Center. That's more than any other state, except for California. Last week, Underwood and 18 other state attorneys pledged to take Trump's EPA to court over its proposed Affordable Clean Energy rule, which would replace former President Obama's Clean Power Plan (Energywire, Nov. 2). At the state level, James has indicated that she would like to expand New York's ban on hydraulic fracturing by blocking any new oil and gas infrastructure in the Empire State. "Companies in New York still contribute to the production of shale gas and feed an industry that is contributing to the destruction of our natural environment," James, who currently serves as New York City public advocate, wrote as part of her clean water platform. Republican Keith Wofford has secured the endorsement of the Joint Landowners Coalition of New York, which has called the state fracking ban an "unconscionable assault." Wofford, an attorney for the law firm Ropes & Gray LLP, criticized Gov. Andrew Cuomo (D) for fostering an adversarial business environment in the state. "Recent AGs have twisted New York's laws, strong-armed companies to settle flimsy lawsuits, and used New York companies as a piggy bank," Wofford's campaign website says. "This has driven away jobs and investment. And the cost falls upon ALL New Yorkers, who are denied jobs and opportunity — because businesses refuse to invest here, or simply leave." The Republican hopeful to replace outgoing Colorado Attorney General Cynthia Coffman (R) has said he will not follow in the footsteps of New York and other coastal states in challenging the Trump administration. States like California and Massachusetts have mounted a "hyper-liberal pursuit of legislation through litigation," District Attorney George Brauchler wrote as part of his "Colorado First" campaign promise. "I will not accomplish by lawsuit that which the legislature refuses to enact." Democrat Phil Weiser, who formerly served in Obama's Justice Department, said a win for him in Colorado's toss-up election would represent a departure from Coffman's approach on energy issues. He criticized Coffman for challenging the Clean Power Plan and for attempting to block the federal government from adopting methane standards inspired by Colorado's model. "I am committed to addressing climate change, and it was leadership by state attorneys general, in Massachusetts v. EPA, who established the important precedent that, under the Clean Air Act, the federal government is required to address carbon as harmful to human health," Weiser said in a statement. If elected, Weiser said he would set up a special unit to assist local officials in their dealings with oil and gas firms. Coloradans are currently grappling with several energy issues, including a proposed 2,500-foot setback for oil and gas facilities and a state Supreme Court case concerning regulators' consideration of climate impacts in approving energy projects. Attorney General Lisa Madigan's (D) decision not to seek a fifth term will erase a key climate activist from the nation's ranks of state attorneys general. In the close race to replace Madigan, Democrat Kwame Raoul appears poised to follow in her footsteps. The state senator said he supports "bold action" on climate change and supports adopting a 100 percent clean energy strategy by 2050. In comments opposing the Trump EPA's approach to evaluating cost-benefit analyses for new regulations, Madigan joined several other states in their warning that the federal government would prioritize industry interests above human health. "As with EPA's other pending proposals initiated by former Administrator [Scott] Pruitt that threaten to undermine the integrity of EPA's science- and data-based decision making ... the Administrator's notice signals yet another unsupported attempt to undermine EPA's mission to protect public health and the environment," they wrote. During her House bid in 2014, Republican candidate Erika Harold called for a measured approach on regulations to slash greenhouse gas emissions. "Changes in climate can be caused by numerous factors," she said in an interview with the Champaign News-Gazette. The winner of the race to become Michigan's next attorney general will have an influential voice in development of Enbridge Inc.'s Line 5 oil project. Democrat Dana Nessel has pledged to shut down the pipeline and any other project that could harm the Great Lakes. "My first act in office would be to immediately file suit in the court of claims to seek an immediate injunction to shut down Enbridge Line 5," Nessel said in a statement. Tom Leonard (R), current speaker of the Michigan House of Representatives, has touted his role in working with Gov. Rick Snyder (R) to build an underground tunnel around the aging pipeline. "There are tens of thousands of residents here in the Upper Peninsula that depend on the propane that comes through that line to heat their homes," he said in a statement to a local ABC affiliate. "I would never support a plan that's going to leave tens of thousands of citizens here in the Upper Peninsula without the ability to heat their homes." Current Attorney General Bill Schuette (R) is running for governor. Arizona's incumbent Attorney General Mark Brnovich (R) has been pulled into a dispute over a renewable energy ballot initiative. Proposition 127 would push the state's regulated utilities to generate at least half of their annual electricity sales from renewable sources by 2030. The group Clean Energy for a Healthy Arizona called out Brnovich for ballot language that implied the measure would impose costs on customers rather than save them money (Energywire, Oct. 15). They linked the changes to Brnovich's receipt of campaign funds from Arizona Public Service Co.'s parent company. Brnovich has sued the clean energy group for interfering with his bid for re-election against Democrat January Contreras. Florida: A new coalition leader? Under Republican Attorney General Pam Bondi, Florida hasn't been involved in multistate challenges of the Trump administration's energy policies. That could change if the state elects state Rep. Sean Shaw (D) as Bondi's replacement, Nolette said. During the Obama years, former Florida Attorney General Bill McCollum (R) led multistate battles over the Affordable Care Act. Nolette suspects that the Sunshine State under a Democrat could once again serve as a coalition leader. "I think a Democratic attorney general would potentially play a big role in environmental issues, given that they affect Florida so directly," he said. Governing magazine rates the Florida race a toss-up between Shaw and his Republican opponent, former Circuit Judge Ashley Moody.